As we welcome 2018, we want to give you the newly added apps and themes in the phpFox store. Some of you might be wondering what is the purpose of the apps and themes and where and how to use them. These 3rd party apps and themes are add-ons that you can download and install into your site. You can find a wide variety of free and paid add-ons in the phpFox store. These add-ons are developed and supported by our 3rd party experts globally. Using 3rd party add-ons will definitely add more features to your site that will absolutely attract many users.Let's take a look at the latest apps and themes for the month of December 2017.1. Bucket List by FoxerDESCRIPTION Bucket List App is a powerful app with a responsive layout that allows you to create and manage a list of things to do! By setting down a different list of things you may find more motivation and inspiration in life using our new app.Learn more →2. Birthday App by FoxExpertDESCRIPTION Do you know that Birthdays is a basic feature of each social networks? Are you sure that you have enough features for that? Look at our Birthday App. Add a new personal touch to your social community. Enable your users to never forget any birthdays of friends, and send birthday wishes to the users of your site.Learn more →3. Comment Image by Scheinwelt-MediaDESCRIPTION This app is small and efficient in uploading images to comments. Your users will love the ability to comment on images. Monetize your site by allowing only specific usergroups to use the upload feature.Learn more → HELPFUL LINKS Themes - https://store.phpfox.com/themesLanguage Packs - https://store.phpfox.com/language3rd party Experts - https://store.phpfox.com/techie/browseApps Packages - https://store.phpfox.com/bulkApps - https://store.phpfox.com/apps You can use the search tool to find any specific app that you are interested in. When the app or feature that you like is not listed in the store, you can contact the 3rd party experts to customize one for you. Very flexible isn't it?If you have questions about these 3rd party add-ons, you can reach out to the experts directly. You can also read our New Apps and themes in November 2017 in case you missed it.Happy New Year! It is time for you to discover the latest apps and themes to date. Our developers have added new products to the store that you can absolutely install on your phpFox websites. These 3rd party plugins have just been uploaded last month, November. You can use these easy to set up add-ons to enhance your sites.1. Passion Template[v4] by YouNetCoDescription What drives you to continuously discover new things and accept challenges? It's the Passion. Passion is one of the most powerful engines of success and the source of the finest moments. Whatever you do, bring your soul into it, and you will accomplish your objectives. We bring this spirit to our template with the hope that everyone can achieve great success with enthusiasm and passion.Passion Template is expected to bring a new way to promote your website. We understand that a beautiful layout attracts people to come to a website, but the content is the main factor that keeps people stay. Therefore, we combine the two things into this Passion Template. The theme focus on showing the most interesting content in a fresh and delightful way such as news, featured events, photo galleries, video clips or blogs. No matter what your community is about, whether you are a blogger or a company, Passion Template will suit your needs.Learn More →2. Feed Delete by Scheinwelt-MediaDescription With this app, you can delete feed entries that are older than a given value. This helps to get your database smaller.Learn More →3. Tweet Limiter by Scheinwelt-MediaDescription With this app, you are able to limit the number of characters in status updates and/or comments.Learn More →4. Mega Menu by FoxExpertDescription The ultimate solution to have a drop-down menu with images and 3 levels of navigation. Included unique mobile sliding menu with icons and images, works great on any device. Different types of dropdown menu and many design settings will make this app very flexible and configurable.Learn More →5. Handshake by Scheinwelt-MediaDescription With this app, your users can give handshakes to other users. The other user will not get modified until he also gives a handshake. When both users have a handshake, they will get a notification. There is also a setting to allow this feature only for specific user groups. With this setting, it is possible to monetize your site.Learn More →6. Advanced Comment by FoxExpertDescription Looking to spice up the ‘Comment’ section of your site? Look no further, this simple app will increase numbers of comments for each content entry.The app included default 4 packages of smiles and 10 great stickers.You’ll be able to manage smiles and stickers from the admin panel and add additional smiles and stickers which fit your niche PHPFox site. Problems with spam in comments? We prepared great comments to manage section in AdminCP.Learn More →7. Let It Snow by FoxerDescriptionBrings Christmas and New Year mood. Adds falling snow on all pages of your website. Learn More → Which app is right for your site? What did you think about the new apps? Does anyone catch your attention? How about the new theme?We hope that this list has helped you narrow your search down. When looking at these apps and theme, don't forget to try out their demo and explore the features.Have any questions about these apps and themes? Please contact the vendors directly via your client area account. Or submit a ticket if you need support from your site. You can also chat with our live chat agent on our website. Get ready to discover new apps and themes in October. Our experts were very inspired in providing you excellent products as time goes by. As you may know, 10+ new plugins have been recently added in the phpFox store. Let's all check the highlights of these new apps and themes.Subscribers by Scheinwelt-Media INTRODUCTION: This app adds a block with new subscribers. Other users can see who has recently subscribed and want to be on that cool block too. FEATURESShow recent subscribers Set limit for block Set packages that show up in the block Show package title Link to user and subscribe page Multi-language support More features on requestProximity Feed by Scheinwelt-Media INTRODUCTION: This app adds a proximity filter for feed items. The feed will only show items within the distance radius. FEATURESSwitch between miles and kilometers Option to show distance on the feed item Multi-language support Set as many options you want (default: Show all, 5, 10, 50, 100, 200, 300, 500 & 1000 km) Monetize this app by only allowing specific user groups to use the filterPost View Counter by phpFoxer INTRODUCTION: Every day on each website, hundreds of posts are made. That is why we have created Posts View Counter app to help authors track viewers' reactions. Sometimes, the number of "likes" does not show how interesting the post is as the real number of views is always many times greater than the amount of "likes".Photo Block by Scheinwelt-Media INTRODUCTION: This app adds 4 new content blocks for photos to your site. It can help to monetize your social network by showing only photos from specific user groups. FEATURESRecent photos Most viewed photos Most liked photos Recent profile & cover photos Usergroup setting (deactivate photos from specific user groups. e.g. show only show only photos from premium members)Advanced Blog [V4] by YouNetCo INTRODUCTION: Most people love sharing. But sharing photos in feed or posting a status isn't enough to showcase everything. And that's when the blogging came in. The blog is an environment where people can share everything about their lives, experiences, news, information, etc. It is one of the trends in a social community to satisfy the fans by writing. FEATURESFully responsive, support Responsive Templates Integrate with Pages, Group and other YouNetCo apps: User Profile, Business Directory System, Social Publisher, Suggestion & Recommendation System Support new mode view: Bigview Blocks: Featured Blogs, Most Read, Most Favorited, Most Discussed, Hot Tags, Tags, Recent Post, Categories, Recent CommentsMessage Broadcasting by phpFoxer INTRODUCTION: Message Broadcasting app is a simple way to notify members about:news of your community promotions or important notices events or changes related to a specific user group information related to one specific gender FEATURESSelect one or more target user groups; Select one or more target genders; Use [full_name], [email] tags to fill message with appropriate username thus make the message more personal;Gaming Theme by phpFoxer INTRODUCTION: Communities for gamers is an essential part of the social networking world. We think about all gaming world and this is our new theme with a few really amazing built-in features:video background; an option to show only central column to make the focus on activity feed and disregard blocks you don't need (columns can be shown/hidden by switching AdminCP settings); broad header with the compact menu; improved configurable advanced footer built-in to the theme; special configurable landing page that should fit all gaming needs.Advanced Feed [V4] by YouNetCo INTRODUCTION: Social Network is successful because it can satisfy the need of connectivity among people. We are always interested in being updated with the latest activities and connecting with other people. We do these things by quickly posting new contents, reading, sharing and commenting on other’s contribution. Therefore, we have developed an app, the Advanced Feed, with very trending features of feed such as mentioning feelings in the post and control what is being shown in each user's feed. Privacy and Filters help users share their feed with the right people and make their main wall cleaner by filtering out unnecessary things. In addition, it provides Feelings, emoticons, location check-in and business check-in which are a must-have on any social network. FEATURESFeeds will be loaded automatically while scrolling page down Filter member’s news in Activity Feed by default criteria:All updates (default): show news that is the latest posting Friends: show news of your friends Status: show member status List: show your custom lists. You can filter news in one specific listAdmin can add more modules from core, YouNet's modules, thỉrd party to filter feeds Tagging – increase interaction between members Feeling status – diversify type of user postsDating System by FoxExpert INTRODUCTION: Looking to turn your PHPFox site into a full dating website (similar concept to Tinder)? Whether it’s your whole site converted to a dating system or simply a side feature to enhance your social network, this app is the perfect solution for sparking relationships amongst your users. The app features great responsive design and many custom features like (Like/Skip, Dating fields, Dating photos, and videos) all of which will help you get success from your dating niche. FEATURESUltimate search filter (core fields + custom fields + dating fields) Ability to save filter Like/Skip users (like photo battles) Notification after like/mutual feature (also notification shown on section menu +1) Profile Info, Dating Info, Photos, Videos, Badges tabs during looking profile I like, Who likes me, Mutual likes, Already viewed special pages with great design.Usergroups Block by Scheinwelt-Media INTRODUCTION: This app adds a generic block to your site that shows users of specific user groups. You can use this e.g. to show your team or to show all premium users. The user group shows up under the users' entry. Just select all user groups you want to show and set a limit. Activate a "View All"- Link that sends the user to a page with all users of the selected groups listed. Rename the block and page titles to whatever you want to fit your requirements. FEATURESSelect user groups for this block Shows the users user group under the image Enable/Disable "View All"-Link Set limit for users in the block Page to show all users of the selected user groupsComment Reply by Scheinwelt-Media INTRODUCTION: This app gives you an alternative comment reply function. It adds a comment id next to each comment. When a user clicks on the id this id is inserted to his comment text field and he can reply to the specified id. FEATURESAdds a clickable comment id to each comment Change the phrase that will be inserted on clickphpFoxer mobile apps 2.0 Today marks the beginning of an all-new iOS and Android applications for phpFox. And these updates are just the first of many big things to come. Here is what's new:100% native iOS and Android apps; connected to your phpFox through REST API; traffic-efficient; based on most modern technologies and UI/UX.If you missed out the community roundup last September, you can still visit this page and check out the apps and themes added in September. You can reach out to the developers directly if you have any questions from these apps. We're sure you'll all enjoy using these new apps and themes. 'Til our next community roundup! Get ready for the New Apps and Themes in September. We are about to give you the latest updates about the newly added apps and themes in the store. 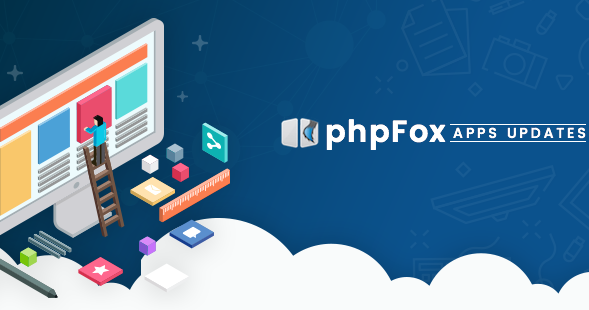 phpFox Experts, also known as 3rd party developers, have been continuously producing fresh and compelling apps that you can integrate into your phpFox site. These add-ons are now available in the phpFox store. You can easily purchase and install them via your AdminCP. Let's get to know them one by one.Advanced Members [V4] by YouNetCo INTRODUCTION: The most critical challenge to make a prosperous community is the ability to establish, keep connections between users as well as provide them opportunities to find old friends or new friends in most convenient manner. [V4] - Advanced Member is here to satisfy this demand. This app has most of the advanced features that you need to increase user interaction on your community, such as highlighting members, simply browsing and searching other people, suggesting friends, get notifications, messaging, sending birthday wishes, rating and reviewing members.FEATURESSupport default Bootstrap and all YouNetCo Responsive Templates. Ability to browse members with Friends, Featured Member, Member's Review, Member's Rating and Member's Birthday Support search box with sort options: Most Reviewed, Most Favorited, Highest Rated Support advanced search with several criteria: gender, membership, ages, address, custom fields Birthday Reminder block allows member to send Birthday Wish to friend's timeline Support profile information such as Rate and Review info, live in, studied in, etc Member can follow, rate, write review for othersFrontslider by Scheinwelt-Media INTRODUCTION: This app adds a beautiful fullscreen slider on your sites front page and disables the standard banner images.FEATURESFullscreen slider 4 Slides Multi-language support Support for mobile devices Each slide has its own buttons Easy image upload Optional looping feature with special effects (fade, slight right, slight left) More features in the next versionRecent Blogs by Scheinwelt-Media INTRODUCTION: This app adds a recent blogs block with some special features to your site.FEATURESSet number of recent blogs Sorting options: Recent, Total Like, Total Comment, Update Time Show the first picture of listed blogs Usergroup setting for blogs (deactivate specific usergroups from recent blogs list. e.g. show only blogs from admin and staff) Multi-language supportRandom Blogs by ScriptTechs INTRODUCTION: Want to get some attention for your blogs? You know you do! Is your site going flat? Perk it up by showing the random blogs in a block. Let your users see what's happening and encourage them to have a more active part in your site. It's all about activity these days. If users see stuff happening, they want to be part of the action and will stay on your site more and add content. More users interacting on the site means more sign-ups. More blogs mean Google and other search engines are happy as they love those blogs!FEATURESEasy "one-click" install for PHPfox Neutron V4. Displays random blogs in a block on core.index-member (Home) page. Displays in a movable block which can go anyplace you choose. Shows blog image if the blog contains an embedded or inline attachment image. Uses phrase manager for the block title. Setting in the App allows you to choose how many blogs show in the block.Login, sign up, share via Social Account by Simplify Social Network INTRODUCTION: With this app, users do not hesitate to become a member of your community and are ready to share/exponent contents to popular networks.FEATURESLogin via large social network accounts like Facebook, LinkedIn, Google, Twitter easily Sign up with large social network accounts like Facebook, LinkedIn, Google, Twitter and profile is generated automatically Share a content to social networks is very simple and friendly with this app. Layout is well responsive. Popular social network APIs are supported: Facebook, LinkedIn, Google, TwitterPages/Business Directory by FoxExpert FEATURESExtend core Page module with huge numbers of functions and blocks. Support 3rd party modules and work great with our Advanced modules. Control which modules available on your page (disable or enable any module). 3rd party modules supported. Create your own menu for your page. Rich information about pages like (custom page, announcements, faq and etc) Ultimate filtering options including search by location and show pages near you. Good monetization with sponsored features. Manage in admin interface everything. Also, have many admin and user groups settings. More than 50 different blocks. High quality and Live support chat support. Lifetime updates and fast support by email. Mobile responsive (works great on any device).PAYEER® Merchant by ComeMore INTRODUCTION: Connect your website through API to Payeer® Merchant and you can accept international payments online.ROBOKASSA by ComeMore INTRODUCTION: ENGLISH DESCRIPTION: ROBOKASSA — is a service allowing Customers (Sellers/online shops, service providers) to accept payments from Users (customers) with Bank cards, in any e-currency services of mobile Commerce (MTS, MegaFon, Beeline); payments through the Internet Bank leading Banks of the Russian Federation; payments through ATMs through instant payment terminals.Advanced Share by FoxExpert FEATURESReplaced core share icon, with new icon and great hover effect with popular social networks sharing buttons. Changed share popup with adding share content and new Social Share tab. Share to private message Email sharing Share to your friend's wall Works well with all core apps and 3rd party apps. Works on feed and on a single content page. Admin Enable/Disable Advanced share feature. We also released some of the standalone core apps of phpFox aside from these new apps from the vendors. You can check the list at https://store.phpfox.com/techie/u/phpfoxOur experts don't have any new themes for the month of September, but you can still check out some available themes at https://store.phpfox.com/themes These apps and themes are all verified and checked by the phpFox management before we published them in the store. We made sure that they are all passed the standards of the phpFox software by following the guidelines in our Developers Program. phpFox is still accepting aspiring developers for apps and themes. 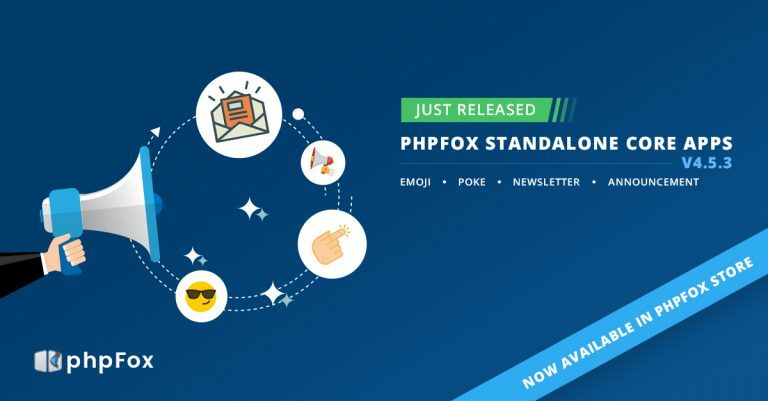 If you are interested in being a part of phpFox Developers, please follow steps written on this page https://www.phpfox.com/developers/Lastly, we encourage you to ask questions from these developers to familiarize yourselves using the apps. They also provide support for these apps. You can always visit our website to see the latest news and updates. Two weeks ago, we have released some of the standalone core apps such as Music, Pages, Photos, CDN Service and Facebook Connect. You can check the article on this page. And as promised, phpFox released another set of standalone core apps and have been officially added to the phpFox store.What are these new Standalone Core Apps? EmojiWe are all using emoji nowadays, and this is one of the best ways to show our feeling to each other. phpFox provides the Emoji app which allows your users to insert more and more emojis while texting. Emojis are a fun and creative way that your users can use to connect with the other members of your online community. This has more become one of the essential features to a social network community. Learn more...PokePoke app allows members of the community to poke their friends to call their notice. Your users basically use poke to catch someone's attention without engaging into a conversation. When a user pokes his / her friend, this friend will get a notification. Learn more...NewsletterNewsletter makes it easy for you to share email to your members within your social network community. Sometimes you may want to send out emails to some specific users to notify about your site or your plan. For each newsletter, you can select the target audiences and write the content with both plain text or rich text. Learn more...Announcement"Announcement" in phpFox is a short functional text that contains some information of facts, such as promotions, events, updates, or intentions, that are presented in public or specific users set by the admins. It supports multi-language and can be shown on the homepage of your website. Learn more...These standalone core apps are now available for download in phpFox store. You can also find the installation instructions in each app detail.You may also submit a ticket in the client area if you have any questions about these apps.Just keep an eye on our future blogs to get the latest news and updates from phpFox. New to phpFox? Visit our website and ask our live chat agent. More phpFox v4.5.3 Standalone Core Apps have been Released! Recently, we released one of the phpFox's standalone core apps which is the Blog App v4.5.3. 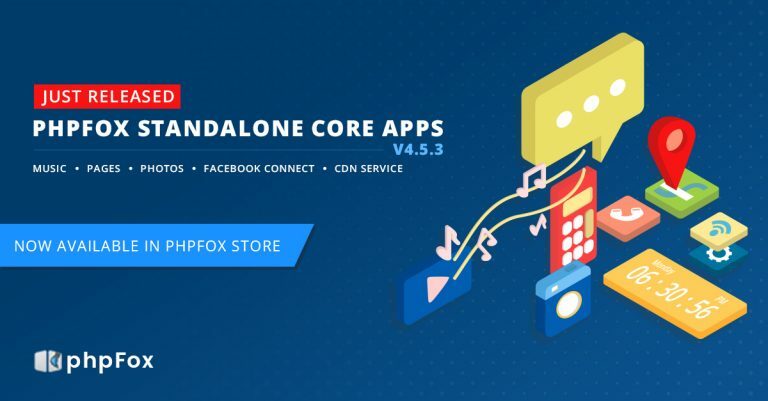 And as we continue, we are releasing more standalone core apps of phpFox in the store.More phpFox Standalone Core Apps As we released these updated core apps, we made sure that all the issues from the current version have been fixed. We also added new features and improvements that will absolutely benefit your site. Now, let's begin to check them out one by one. Music v4.5.3 Through Music app, you just don't make new acquaintances, you can also keep in touch with your friends. Music is a way that connects people more than words can do. Musicians can upload and share their songs and put them into albums and control the specific genre they are in. Your members can listen to these songs/albums and add them to their own profile. New Features and ImprovementsAllow uploading multiple songs Multiple genres Upload song thumbnail photo Integrate with CKEditor (Song description + Album description) Add new pages for owner can manage album songs Integrate with AddThis in Song detail page + Album detail page Add a tab to list user albums in user profile page Add new block "More From <<user>>" to display all albums created by the owner of the current one. Play all songs in album detail page. Repeat feature added for the music player. Support attachment, emoji for Song description and Album description. Statistic information of music (songs and albums) are shown now in AdminCP. More...Pages v4.5.3 In phpFox site, it is the place for your users to specifically create public profiles such as businesses, brands, organizations, public figures, and other causes. Pages do not gain friends but fans or followers who choose to LIKE that specific Page. New Features and ImprovementsDisplay total like when browsing pages Admin/owner can delete/manage pages in listing page Mass action to delete/approve pages Thumbnail for main categories Invite to like pages via email CKEditor for adding/editing pages widgets. Support view more / view less in pages information block. Add new block "People also like" to suggest pages which have the same category with the current one. Support 3 modes for pagination Add the settings"Pages Limit per Category" "Display Pages Profile Photo within Gallery" "Display Pages Cover Photo within Gallery"Add 2 settings for SEO: "Page Meta Description" and "Page Meta Keywords". Statistic information of Pages is shown now in AdminCP. More...Photos v4.5.3 "Photos" is an essential section of all social network communities. We know that images have become more and more important and that is why we don't just provide you a simple core photo app but we have added many trending actions to make it more attractive. Your members can choose to upload photos to a public gallery or to their own set of photo albums. Your members can also select the privacy settings for the photo they upload and choose who can view their photos online. New Features and ImprovementsAll photos that shared from feed will be put in an album name "Timeline Photos" for each user. Add new feed when user update cover photo Integrate with AddThis Support 3 modes for pagination More...Facebook Connect v4.5.3 Since Facebook is one of the largest and most popular social network sites for the publicity, many people would like to use their Facebook accounts to join to other networks. By using Facebook Connect app, your users can join your community conveniently by logging in with their Facebook account. Learn more... CDN Service v4.5.3 A content delivery network (CDN) is a system of distributed servers (network) that deliver content of websites to a user, based on the geographic locations of the user. This is one of the most popular solutions to deliver large scale websites to a global audience. It is effective in reducing latency, accelerating site load times. The closer the CDN server is to the user geographically, the faster the content will be delivered to the user. Hence, if you are seeking for CDN functionalities on phpFox, this app is for you. Learn more...These standalone core apps are now available for download in phpFox store. You can also find the installation instructions in each app detail. However, even they are all free and available for download in the store, you will still need to make sure that you are holding a phpFox license package which is legit to download the app. Every time you choose an app to download, the phpFox store will verify your license if you are eligible to download the specific app. As the LITE license holders can download Music App but not the Photos App while PRO license holders can download all the core apps. You can check the comparison page for phpFox license packages to see what are the features included in your license. You can also ask our live chat agent if you aren't sure about the features of the phpFox package you are holding. Hey, fellas! We're back with the new apps and themes for the month of July and August. Yes, we will introduce all the newly added plugins in the store by our 3rd party developers for the last two months. I'm sure some of you already tried and purchased these apps. But for those who still haven't seen them, please take a look at the summarized list below. User Background by Scheinwelt-Media INTRODUCTION: With this app, users can change the background color or image of your site. The change affects only what the specific user will see. On other profiles, they see other users backgrounds.FEATURESChoose between color and image background Individual background for each user Set usergroups or subscriptions that can use the background feature Color picker for selecting color Set background size in Admincp Set background repeat in Admincp Admin can choose between site-wide backgrounds or profiles only Set fixed or scrolling background in admincp Add container background Copy to clipboard function on images in the photo module (easy copy and paste URL for user) File upload button More features in the next versionsUser Generator by Foxer INTRODUCTION: User Generator for phpFox will allow you to generate up to 5000 users with photos and pre-defined settings. You should not register users manually – you will get thousands in a few clicks.Advanced Badges by Foxer INTRODUCTION: It's always a question for community owners how to motivate members to post more content, be more active, communicate with each other. We have a solution for you today. Badges is one of the key features that add gamification to social networks. You will be able to reward users by giving them badges depending on their activity.Badges will encourage users to interact with each other more frequently, compete with friends in posting new photos, videos, blogs, music and even in adding new friends.Profile Usergroup by Scheinwelt-Media INTRODUCTION: This app shows the members usergroup on the profile page.Change text color Change text sizeThis feature and much more are included in my Usergroup Profile Icon app: https://store.phpfox.com/product/1607/usergroup-profile-iconPlaces by Scheinwelt-Media INTRODUCTION: This powerful app is a generic listing system with geolocation feature (e.g. for shops or businesses). Users can add list entries with geo data (country, city, street) and the item will be displayed on a map. The markers on the map have a link to the entry.FEATURESVerify system Enable/disable location system Enable/disable Map on item view Enable/disable Privacy Setting Font Awesome support Custom field (e.g. for website URL or phone number) Enable/disable group and page links Recent places block on index and item view (can also be added to member index or other controllers) Change map location on places index page Many more features in the next versionIstra(theme) by Scheinwelt-Media INTRODUCTION: A nice flat colored theme with a sticky menu and round borders. It is a bit strange and gives your site a really unique look ;)FEATURESSticky menu when scrolling Modern flat color design Round corners everywhere Full-width homepageAs of today, we already have the total of 260 3rd party Apps and 25 Themes available in the store. You can download and install these apps from your AdminCP. Make sure to keep in touch with the 3rd party developers if you have any questions from these plugins. You can also ask the experts to make a custom app specifically for your website.And for those who want to contribute apps and themes, you can apply as one of the phpFox 3rd party developers. Just visit our Developers Program page for details or ask our live chat agent on our website.